Is massage just for pampering or does it have true biological effects? A recent study showed muscles rebounded better if massaged after exercising to exhaustion. Andrea Petersen on Lunch Break has details on Lunch Break. New research is also starting to reveal just what happens in the body after a massage. While there have long been theories about how massage works—from releasing toxins to improving circulation—those have been fairly nebulous, with little hard evidence. Now, one study, for example, found that a single, 45-minute massage led to a small reduction in the level of cortisol, a stress hormone, in the blood, a decrease in cytokine proteins related to inflammation and allergic reactions, and a boost in white blood cells that fight infection. There’s been a surge of scientific interest in massage. The National Center for Complementary and Alternative Medicine, part of the National Institutes of Health, is currently spending $2.7 million on massage research, up from $1.5 million in 2002. The Massage Therapy Foundation, a nonprofit organization that funds massage research, held its first scientific conference in 2005. The third conference will be in Boston next year. 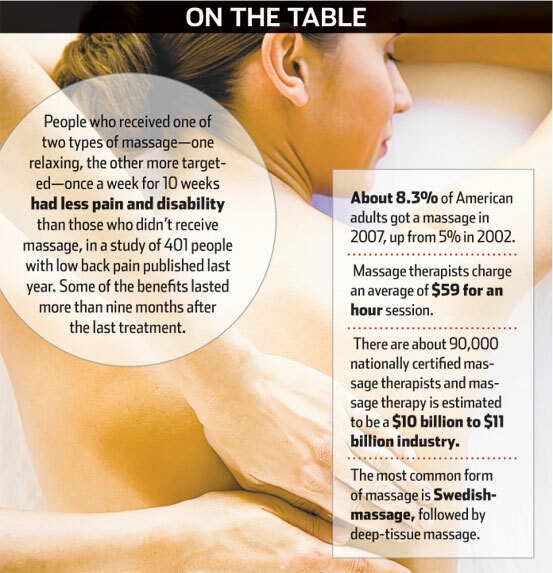 The research is being driven, in part, by massage therapy’s popularity. About 8.3% of American adults used massage in 2007, up from 5% in 2002, according to a National Health Statistics report that surveyed 23,393 adults in 2007 and 31,044 adults in 2002, the latest such data available. Massage was expected to be a $10 billion to $11 billion industry in 2011 in the U.S., according to estimates by the American Massage Therapy Association, a nonprofit professional organization. “There is emerging evidence that [massage] can make contributions in treating things like pain, where conventional medicine doesn’t have all the answers,” said Jack Killen, NCCAM’s deputy director. The massage therapy field hopes that the growing body of research will lead to greater insurance coverage for its treatments. Washington is the only state that requires insurers to cover massage therapy. Aurora Photos About 8.3% of American adults used massage in 2007, up from 5% in 2002, according to a National Health Statistics report. Elsewhere, private insurers generally provide very limited coverage for massage. WellPoint, for example, doesn’t include massage as a standard benefit in most of its plans, but employers can purchase alternative medicine coverage as an add on, said spokeswoman Kristin E. Binns. Aetna doesn’t cover massage therapy as a standard benefit but offers members discounts on massage visits with practitioners who are part of an affiliated network of alternative medicine providers. Providers such as chiropractors or physical therapists, whose visits are often covered, sometimes use massage as part of their treatment. Massage therapists charge an average of about $59 for a one-hour session, according to the American Massage Therapy Association. Treatments at posh urban spas, however, can easily cost at least three times that amount. Most of the research is being done on Swedish massage, the most widely-available type of massage in the U.S. It is a full-body massage, often using oil or lotion, that includes a variety of strokes, including “effleurage” (gliding movements over the skin), “petrissage” (kneading pressure) and “tapotement” (rhythmic tapping). A full-body massage boosted immune function and lowered heart rate and blood pressure in women with breast cancer undergoing radiation treatment, a 2009 study of 30 participants found. Children given 20-minute massages by their parents every night for five weeks plus standard asthma treatment had significantly improved lung function compared with those in standard care, a 2011 study of 60 children found. A 10-minute massage upped mitochondria production, and reduced proteins associated with inflammation in muscles that had been exercised to exhaustion, a small study last month found. 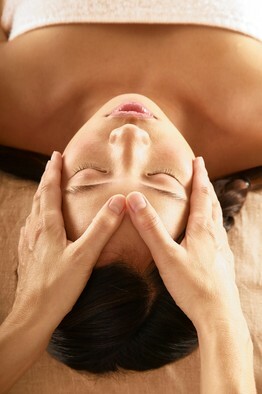 Another common type of massage, so-called deep tissue, tends to be more targeted to problem muscles and includes techniques such as acupressure, trigger-point work (which focuses on little knots of muscle) and “deep transverse friction” where the therapist moves back and forth over muscle fibers to break up scar tissue. Massage is already widely used to treat osteoarthritis, for which other treatments have concerning side effects. A study published in the Archives of Internal Medicine in 2006 showed that full-body Swedish massage greatly improved symptoms of osteoarthritis of the knee. Patients who had massages twice weekly for four weeks and once a week for an additional four weeks had less pain and stiffness and better range of motion than those who didn’t get massages. They were also able to walk a 50-foot path more quickly. “If [massage] works then it should become part of the conventionally recommended interventions for this condition and if it doesn’t work we should let [patients] know so they don’t waste their time and money,” says Adam Perlman, the lead author of the study and the executive director of Duke Integrative Medicine in Durham, N.C.
Scientists are also studying massage in healthy people. In a small study published in the journal Science Translational Medicine last month, a 10-minute massage promoted muscle recovery after exercise. In the study, 11 young men exercised to exhaustion and then received a massage in one leg. Muscle biopsies were taken in both quad muscles before exercise, after the massage and 2½ hours later. The short massage boosted the production of mitochondria, the energy factory of the cell, among other effects. “We’ve shown this is something that has a biological effect,” says Mark Tarnopolsky, a co-author of the study and a professor of pediatrics and medicine at McMaster University Medical Center in Hamilton, Ontario. A 2010 study with 53 participants comparing the effects of one 45-minute Swedish massage to light touch, found that people who got a massage had a large decrease in arginine-vasopressin, a hormone that normally increases with stress and aggressive behavior, and slightly lower levels of cortisol, a stress hormone, in their blood after the session. There was also a decrease in cytokine proteins related to inflammation and allergic reactions. Mark Hyman Rapaport, the lead author of the study and the chairman of psychiatry and behavioral science at the Emory University School of Medicine in Atlanta, says he began studying massage because, “My wife liked massages and I wasn’t quite sure why. I thought of it as an extravagance, a luxury for only people who are very rich and who pamper themselves.” Now, Dr. Rapaport says he gets a massage at least once a month. His group is now studying massage as a treatment for generalized anxiety disorder. • How can you make sure you get a good massage? Most states regulate massage and require therapists to be licensed. This usually requires a minimum number of hours of training and an exam. There is also national certification. Members of the American Massage Therapy Association must have 500 hours of training. • Ask how many massages a therapist gives a day—and make sure you’re not the 10th or even the seventh. ‘It takes a lot of physical exertion to deliver a therapeutic massage,’ says Ken Morris, spa director at Canyon Ranch, a health resort in Tucson, Ariz. Canyon Ranch limits its therapists to six massages in a day. A version of this article appeared Mar. 13, 2012, on page D1 in some U.S. editions of The Wall Street Journal, with the headline: Don’t Call It Pampering: Massage Wants to Be Medicine. This entry was posted in BLOG FX, Body Care and Fx-ercise, Information & Resources and tagged massage as medicine, massage research information, massage therapy, therapeutic massage. Bookmark the permalink.